The recently concluded 24th Auckland Round on Regional Comprehensive Economic Partnership (RCEP) negotiations witnessed a remarkable change among member countries’ commitment toward concluding talks on the regional free trade agreement. This was emphasised by leading trade negotiators from New Zealand and India who participated in the negotiations in Auckland which held from October 17-27. The Indian Weekender has been closely following the trade negotiations with some exclusive interviews with key negotiators. Mark Trainor, New Zealand’s leading trade negotiator on RCEP told The Indian Weekender that there was a remarkable intensification around negotiations this year particularly – a fact corroborated by many senior Indian trade negotiators in Auckland. India’s lead RCEP-trade negotiator Sudhanshu Pandey, Additional Secretary, Ministry of Commerce and Industry, who was leading the team of Indian negotiators, in an exclusive interview with The Indian Weekender said, “We are very happy. Similar views were expressed by another senior Indian trade negotiator, Damu Ravi, Joint Secretary, Ministry of Commerce and Industries. Mr Ravi said, “I must say that during this particular year we have intensified negotiations both at a multilateral level among the sixteen countries and also bilaterally. “We are moving very fast than what could have been possible otherwise,” said Mr Ravi. Meanwhile, Mr Trainor also expressed satisfaction on the progress of talks in the recently concluded regional trade negotiations. “It was a substantial round with more than 600 delegates present across a full range of areas. “We emphasised the need for all negotiators to exercise maximum efforts to ensure to achieve the target for delivering a package of outcomes by the end of the year,” Mr Trainor said. “We were able to technically conclude the chapter on dispute settlement that brings the number of the technically concluded chapter to five, which is quite significant. “We also progressed on negotiations on market access and will continue to work towards the conclusion of negotiation as a collective responsibility,” Mr Trainor added. The officials from both countries were absolutely clear that changing global trade environment was one of the catalysts towards increasing convergence in multi-countries trade negotiations. “I think that [the context of global trade challenges] is certainly the case that the negotiations have intensified markedly this year,” Mr Trainor asserted. However, Mr Pandey, was more forthright. “We need to make sure that all countries benefit from this process,” Mr Pandey said. The Auckland round was held three months after the last Ministerial-level meeting of member countries held in August in Singapore, and had huge expectations, given a long time is taken in concluding a final agreement. 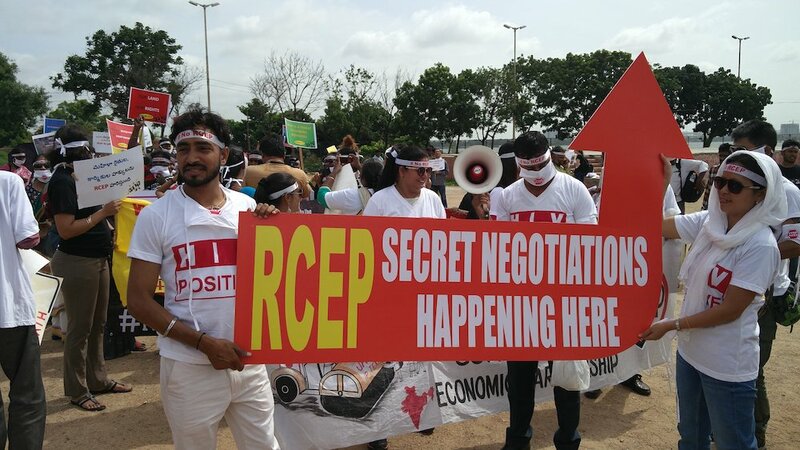 RCEP negotiations were formally launched in November 2012, with 24 negotiating rounds so far, as well as six Ministerial level meetings and several inter-sessional meetings, seeking to create a free trade area over a large part of Asia and Oceania. The RCEP envisages a free trade area involving all ten members of the Association of Southeast Asian Nations (ASEAN), along with six countries with whom ASEAN has a Free Trade Agreement – Australia, China, India, Japan, South Korea, and New Zealand. The RCEP countries, according to New Zealand government statistics, in March 2018, accounted for almost 32 per cent of world GDP, at US$27 trillion, and 28 per cent of global trade, while covering more than 3.5 billion people.